I love potatoes and like to cook with them often. 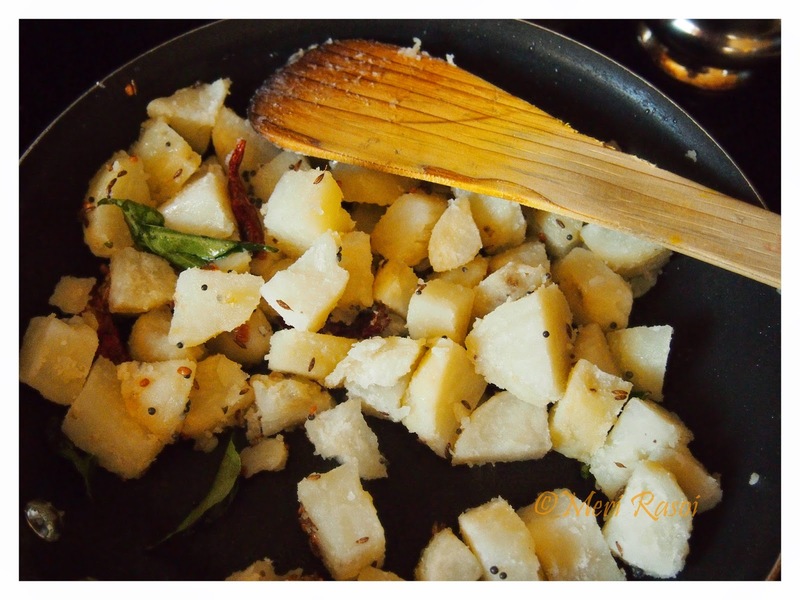 Sometime back I had shared with you a recipe for "SPICY POTATO CUBES" which had a little South Indian influence to it. 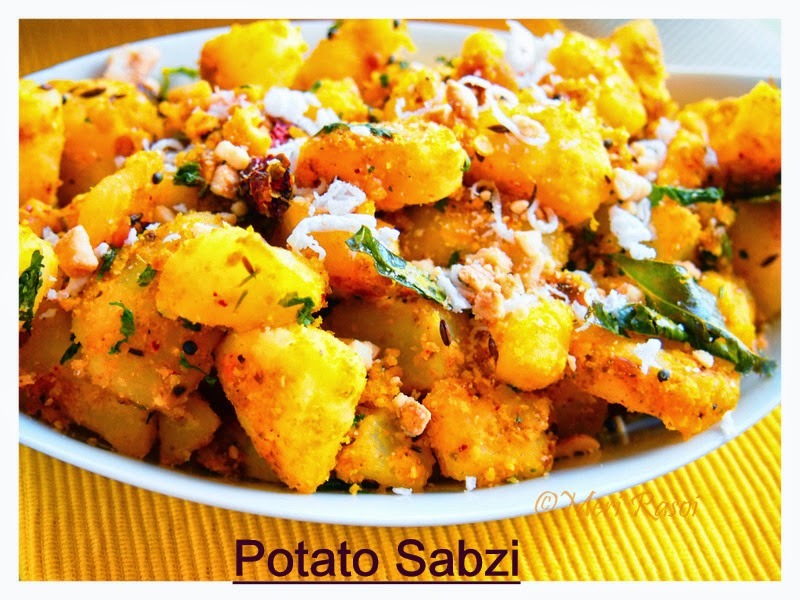 Today, I will share with you all another spicy potato sabzi but this one with a Maharashtrian influence. In my previous post of Shrikhand, I had mentioned about chatting with my dear friend Rushali. During the conversation, she had mentioned that on the day of Gudi Padwa, they would eat Poori, Aloo sabzi, Shrikhand and Masala Bhat. So I too decided to go with the same menu. 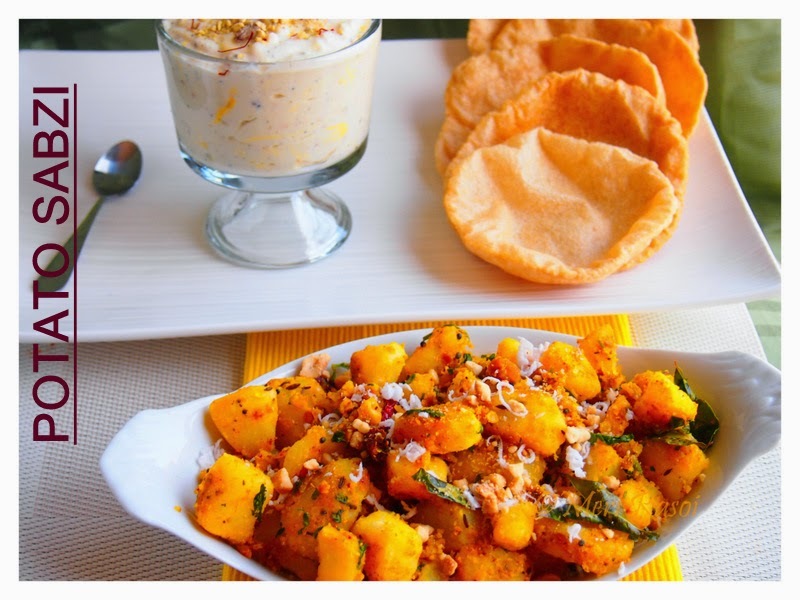 I have already shared the recipes for Masala bhaat, Poori and Shrikhand. 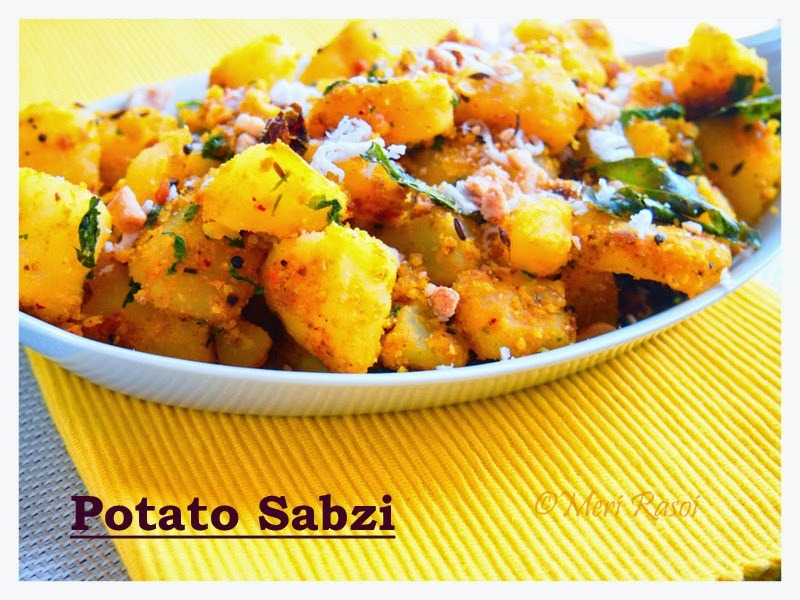 In this post, I will be sharing with you all a recipe for Potato sabzi influenced by the Maharashtrian style of cooking. It is a simple recipe without the use of onions or garlic. I have used a spice blend the same as the one used in MASALA BHAAT. 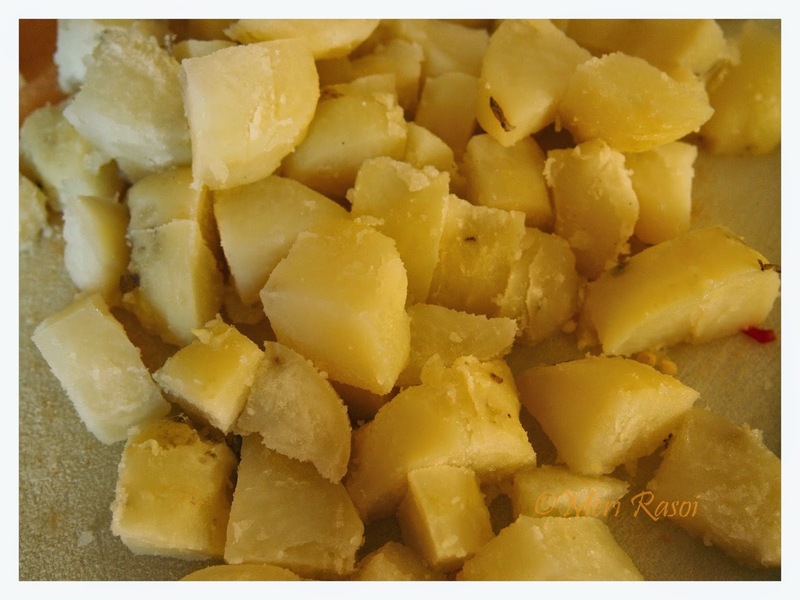 This post is also a part of the Blog hop event " Gudi Padwa / Ugadi specials". Chopped cilantro and freshly grated coconut for garnishing. Dry roast all the ingredients except sesame seeds and dry dessicated coconut. Once the ingredients are well roasted set it aside.In the same pan , dry roast the sesame seeds and dry dessicated coconut separately. Once done , add them to the previously roasted items. Once cooled, using a dry grinder , make a powder out of them. 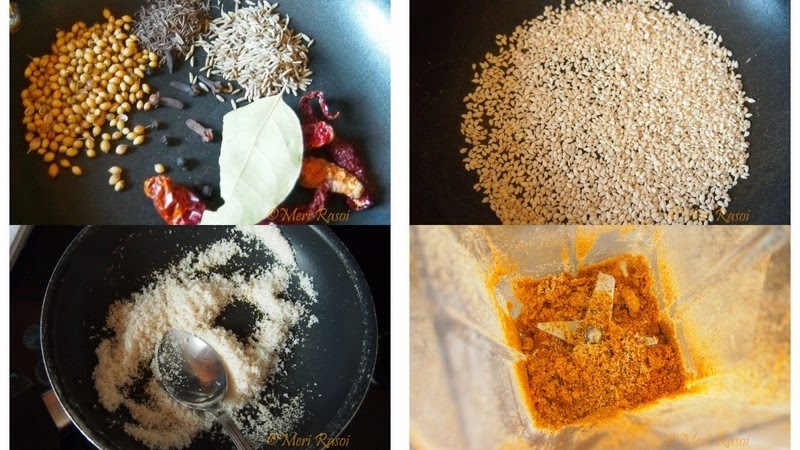 Keep this spice blend aside. Take sufficient water in a pot. Add the washed potatoes. 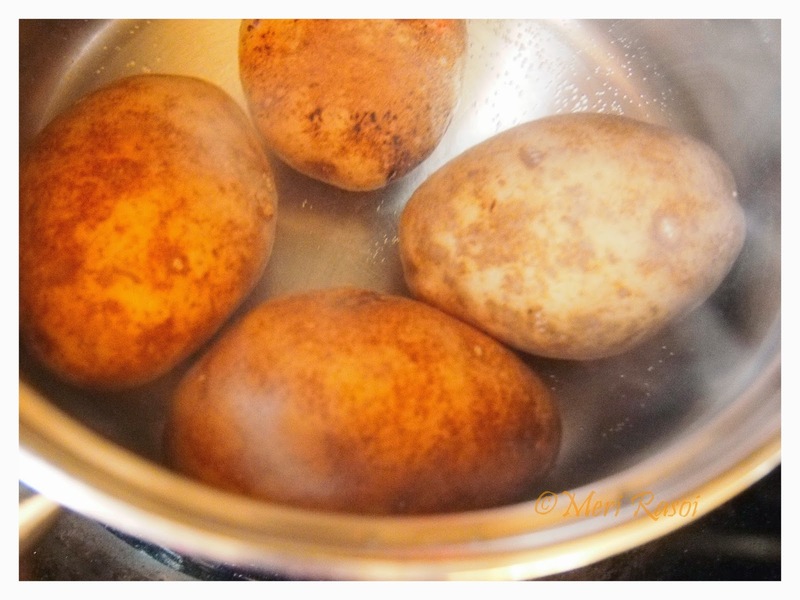 Cook until the potatoes are tender and soft. Set it aside to cool. 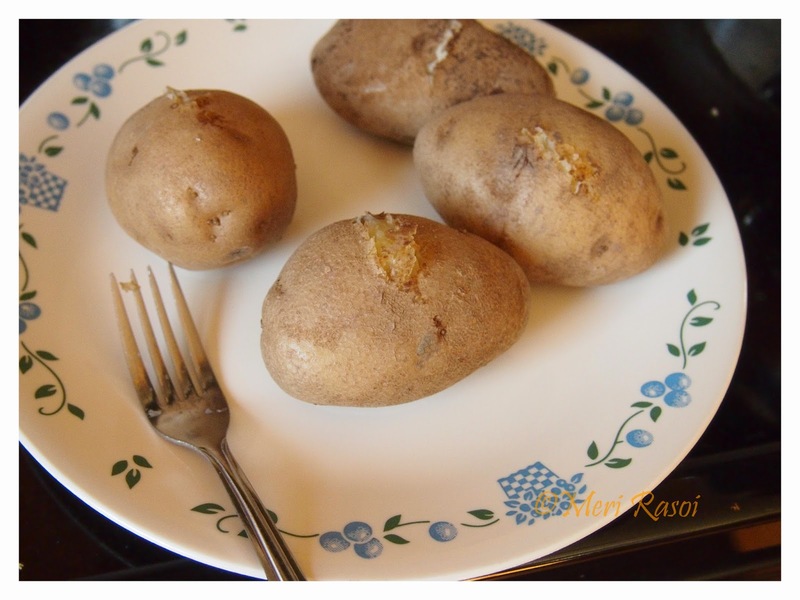 Once cooled, remove the skin from the potatoes and cut them in to cubes. Heat oil in a pan. 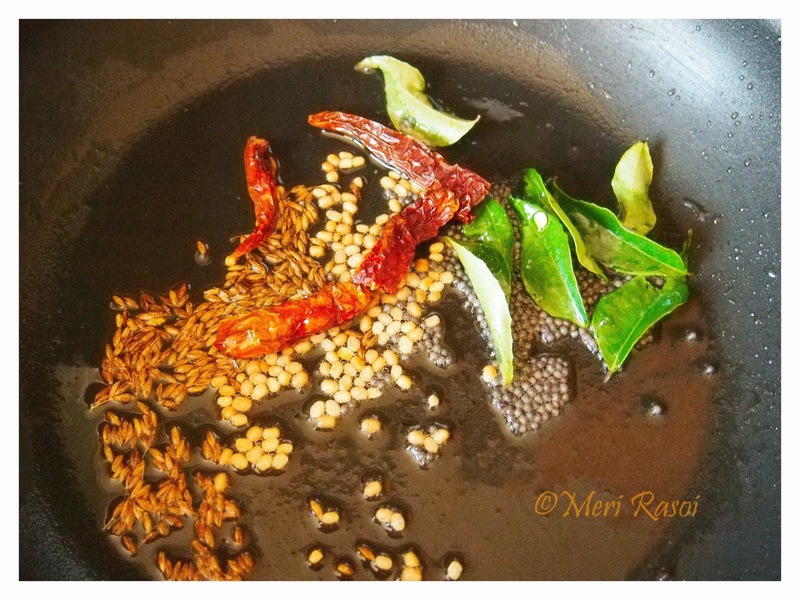 Once hot, add the cumin seeds, mustard seeds, urad dal, dried red chillies and curry leaves. When the seeds start to splutter, add the cubed potatoes and mix well. 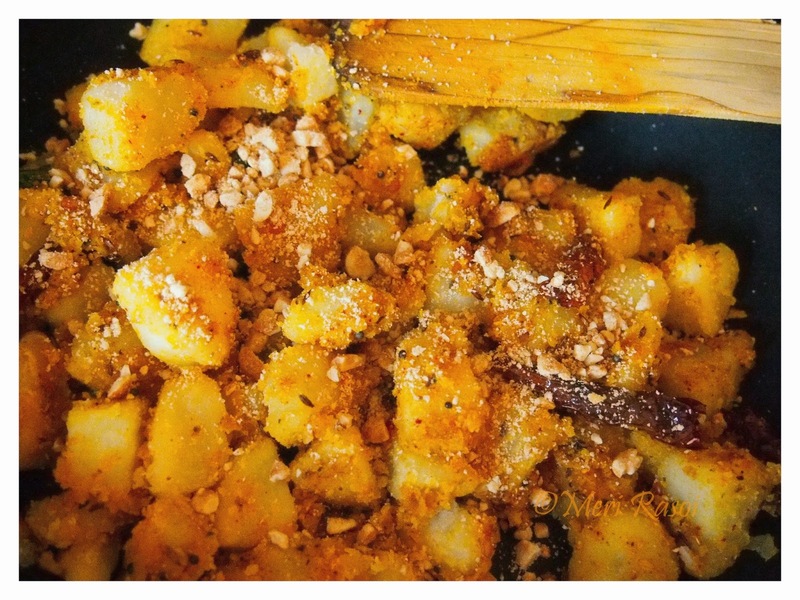 Once the spices have blended well with the potatoes, add the lemon juice , sugar and coarsely powdered roasted peanut powder. 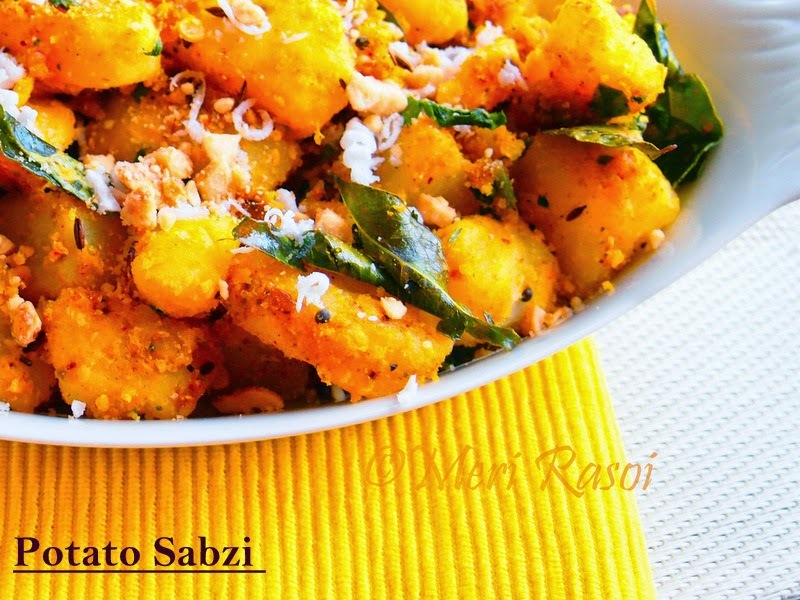 Garnish with chopped cilantro leaves and freshly grated coconut.Serve it with Pooris and Shrikhand. lovely recipe dear Shubha. Looking at the shrikhand sitting there with the inviting pooris and delicious potato sabzi - too tempting! Triple wow! Packed with flavours. Its the same story in my house. Everyone loves anything made with potatoes. 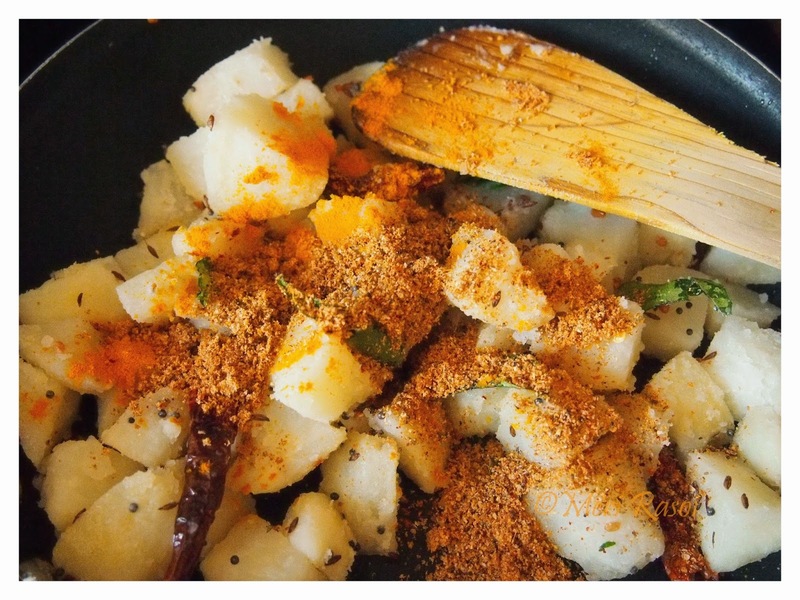 I simply love these bite sized potatoes cubes lapped up in finger licking spices. 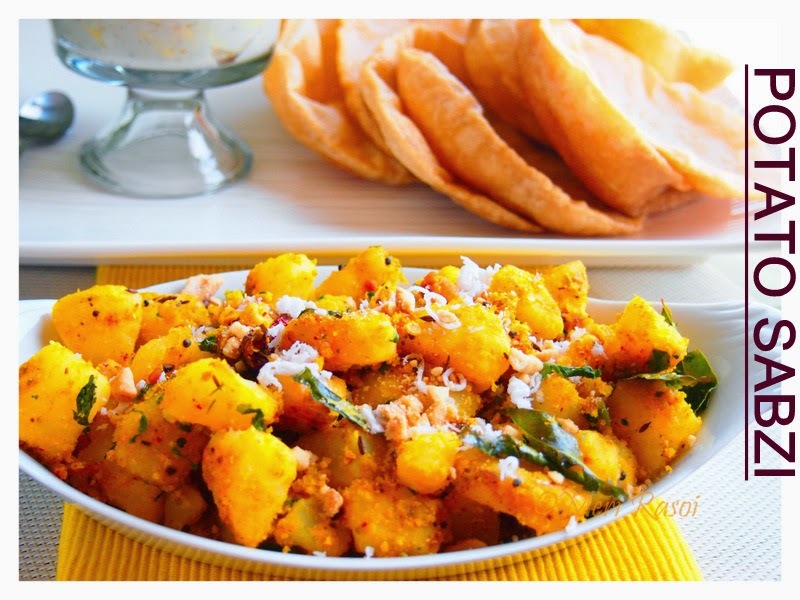 Shubha with poori the potato sabji is the star which any special or festive occasion cannot do without. I am sure a lot of your fans including me will surely try out this well explained recipe. I loved it so so much.